A Trail of Two Tunnels! 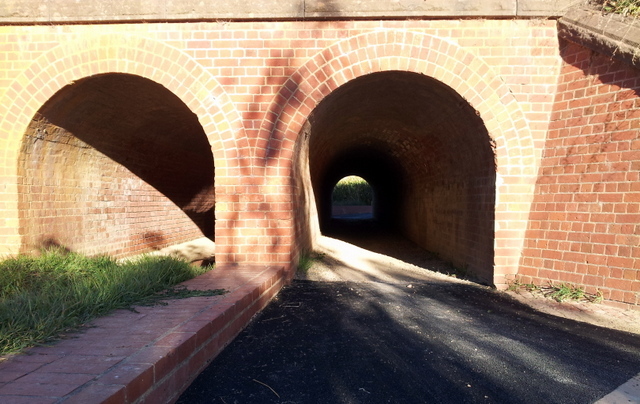 The O’Keefe Rail Trail has two tunnels, yet were they initially built as tunnels for trains? Unlike many tunnels on rail trails built upon former railway alignments, both these trail tunnels have never had trains going through them. Yet one does have a railway connection! With the 2014 extension of the rail trail through Axedale, it was necessary to bypass a section of the original railway’s route. Planned trail route options involved the McIvor Highway and the Campaspe River. The outcome in January 2014 was to close the busy highway completely, to construct an underpass. 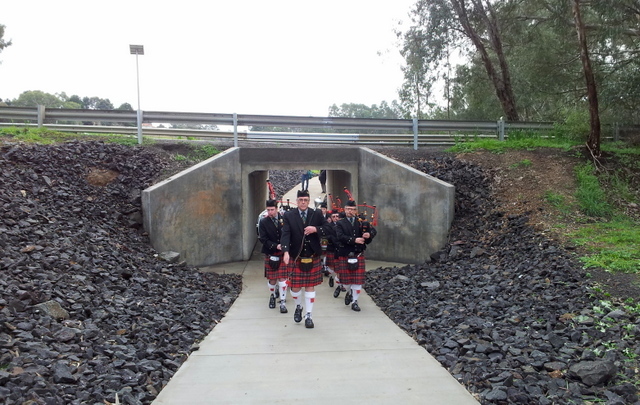 Completed over one weekend, the structure was to also create a new local attraction, the Axedale ‘Tunnel’ connecting both sections of the once divided Axedale River Reserve. The trail’s other ‘tunnel’ was constructed much earlier, in fact over 150 years ago for the Victorian Railways! Used by the O’Keefe Rail Trail since 1999, this ‘tunnel’ is not really a railway tunnel as it forms part of a large brick culvert constructed for the original Melbourne to Murray River Railway to divert water flows. Located in the Bendigo to Echuca section (built between 1862 and 1864) at North Bendigo, the culvert’s construction of clay fired bricks and quarried bluestone is a testament to the original design and trades skill of the 19th century. During the planning of the O’Keefe Rail Trail’s ‘stage 2’ extension in 1998, how to build the trail on the original Wandong-Heathcote-Sandhurst Railway alignment, past the then operating North Bendigo Railway Workshops, and factor in the nearby Melbourne to Murray River Railway was a real challenge. One proposal was to divert off the original Heathcote railway alignment adjacent to the Workshops and use a section of the nearby railway culvert. Being part of an operational railway line, apparently approval to use this structure for a trail was not gained quickly! Yet the end result did overcome the obstacles, and allowed the trail to connect with Bobs St and Napier St in North Bendigo. 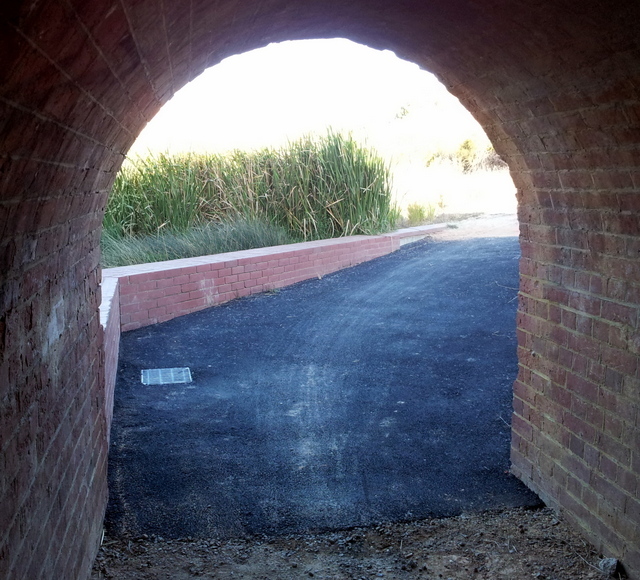 Recent O’Keefe Rail Trail maintenance works, by City of Greater Bendigo Council at this ‘tunnel’, has improved the entry-exit surface making the experience for O’Keefe Rail Trail users much safer and enjoyable.